Daisy Dog is abloom with brightly colored flowers! Her soft, fuzzy face and sweet smile win loyal friends everywhere. 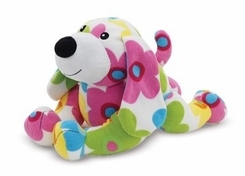 With ultra-soft fleece fabric and soft fill, Daisy is irresistably huggable.